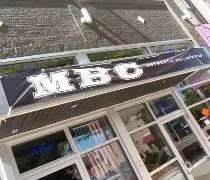 MBC on Washington Square in downtown Lansing. The wait is over. 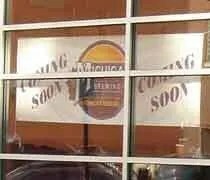 The Michigan Brewing Company put the “Coming Soon” sign on their building in downtown Lansing over a year ago. I would drive by every now and then to see if there was any progress. I would periodically send e-mails to the marketing department in Webberville to see if they would give me anything, but never could get a solid answer. All of a sudden, a few weeks ago, I saw a Tweet from Lansing PSD that MBC was opening. The plan all along was to run some errands this morning then head downtown for lunch. Of course, City Pulse beat me to the punch with an article in this week’s edition. MBC is near the corner of Washington Square and Kalamazoo Street. The parking available is in front of the building in angled street parking. There are a few spaces directly in front of the building, but more than likely, you’ll have to park and walk. Not a big deal as there is plenty of parking spaces along Washington Square. After a couple long days at the hospital, I needed some real food. I grabbed my mom and we headed to Bourbonnais (home of the Chicago Bears training camp) for some grub. Brickstone Brewery is still one of the hottest places in the Kankakee area. We went to dinner on a Friday night knowing we could be heading into a wait. You see, if you get there after 5:00 on a weekend, you will probably have a wait. We got there about ten minutes before 5:00 and were lucky enough to get a table without a wait. Brickstone is located where the former Greenbriar Restaurant used to be. Brickstone is a total overhaul. Having lived in a couple different cities over the last decade, I’ve gotten used to finding restaurants like this, but Kankakee has never seen any place like this. Brickstone is a brew pub. They brew their own brews, but they’re smart enough to have the domestic staples on hand. In a place like Lansing, you could get away with just having your beers. Not in Kankakee. They’d be out of business if they tried that. Grizzly Peak Brewing Company in downtown Ann Arbor. Our day in Ann Arbor was coming to an end and I was starting to get really hungry again. 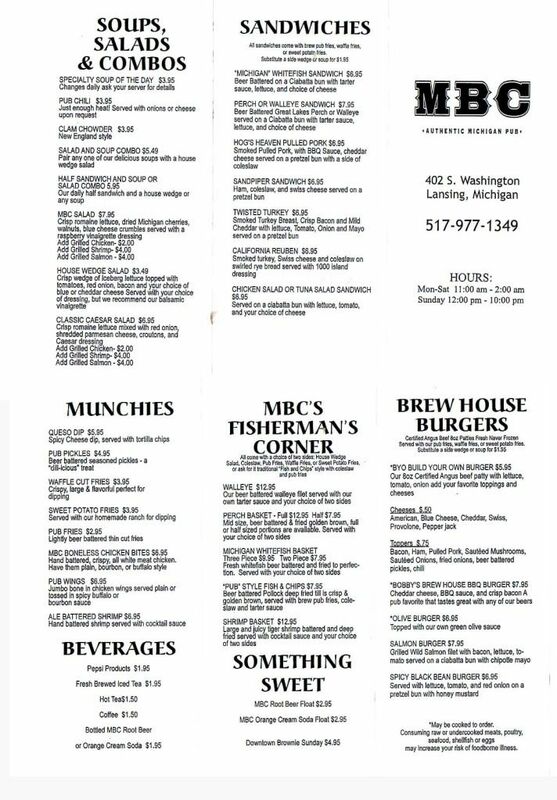 Earlier in the week, I asked for suggestions on where to eat dinner and there was no shortage of recommendations. 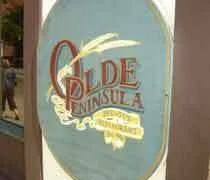 Since we had spent a pretty good chunk of money on lunch and shopping, I didn’t want to hit up one of fancier restaurants on Main Street even though they were quit tempting. Michigan Brewing Company – Coming Soon! – UPDATED! I was in downtown Lansing tonight and noticed that sign you see off to the right. 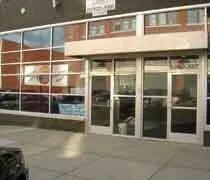 This seems to be a search engine search that brings a lot of people this site, so I figured some of you might be interested in seeing that work is happening at the building located at 402 S Washington Sq. I’ve sent an e-mail to the folks at the Michigan Brewing Company in Webberville to see if there’s any progress and when they are expectin to open. If and when I get a reply, I’ll let you know. UPDATE – I got an e-mail back from Stan Thornbury who is the marketing manager for the Michigan Brewing Company. He said the store is progressing slowly because they are waiting on state licensing. They’re hoping for an opening in the third or fourth quarter of this year. 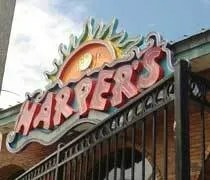 I noticed Harper’s one night while driving around East Lansing pretty late looking for a pizza-by-the-slice place. We didn’t stop because we weren’t looking for a bar and especially not a college bar, but I put that info in the back of my head for future use. 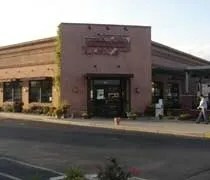 Today, my girlfriend and I were making a run to the Grand Traverse Pie Company to get pie’s for the weekend, but weren’t in the mood to eat there. After driving around with my head cut off, my girlfriend mentioned that brew pub I was telling her about, so we headed down Grand River to downtown East Lansing. 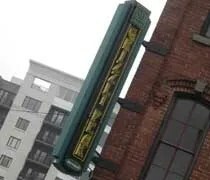 Michigan Brewing Company in Downtown Lansing? I missed this when I read the on-line edition of Noise this past week, but I noticed it in the print copy. The Michigan Brewing Company based in Webberville, MI is looking to open a micro-brewery in Downtown Lansing. The Michigan Brewing Company plans to open another microbrewery and pub at 402 Washington Square in downtown Lansing this year. Owner Bobby Mason said a microbrewery license is “in the works” and plans to lease the building that housed the former Greenhouse Bistro. We ate the Michigan Brewing Company (review HERE) back on April 12 on our way to Howell to shop at the Tanger Outlets. The food was alright, the beer was good, but the atmosphere wasn’t all that great. A Downtown Lansing location would really add a lot the micro-brew.